What shall we draw today? 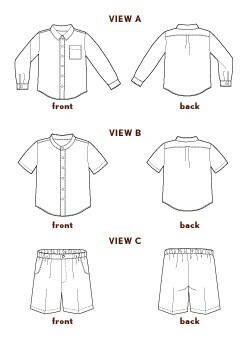 This boy’s or girl’s classic shirt and shorts pattern features a shirt in two versions: a cuffed, long-sleeve option with a one-piece collar and chest pocket or a band collar and short sleeve option. Both styles include button front placket and shirt-tail hem. Below-the-knee length elastic-waist shorts include front pockets and mock fly. Boy’s or girl’s classic shirt and shorts. View A includes one-piece collar, long sleeves with cuffs, and chest pocket. View B has band collar and short sleeves. Both styles include button front placket and shirt-tail hem. Below-the-knee length elastic-waist shorts include front pockets and mock fly. * Measured from shoulder at neckline. ** Measured from center back neck. Shirt: Light- to medium-weight woven fabrics like quilting cotton, broadcloth, lawn, shirting, poplin, fine-wale corduroy, and linen. Shorts: Light- to medium-weight woven fabrics like denim, canvas, chambray, corduroy, twill, and linen.